The best masticating juicer may cost you a pretty penny, but fans of this type of juicer believe the cost is well worth it. There are two main types of juicers on the market: centrifugal juicers and masticating juicers. A masticating juicer is also referred to as a slow masticating juicer. Centrifugal juicers use a spinning action, or centrifugal force, to extract juice from fruits and vegetables. Masticating juicers use a chewing action, much like you chew your food, to extract juices. Unfortunately, masticating juicers are more expensive than centrifugal juicers. The reason involves the process behind the juicing. Both types of juicers take in the food from the top. Centrifugal juicers work faster, and you have a cup of juice in no time. The fast spinning of the centrifugal juicer heats up the juice and adds oxygen. Both the heat and oxygen means the juice has a smaller shelf life and more nutrients evaporate into the air. Masticating juicers are slower, but they extract more juice and more nutrients while leaving the pulp behind. You might hear masticating juicers also called cold-press juicers, but these are both essentially the same. Here are some selling points to look for when it comes to masticating juicers, followed by 10 of the best on the market today. Find the best masticating juicer that suits your needs from the reviews below. Masticating juicers have a few things going for them that centrifugal juicers may not have. Here are some of the main aspects to examine when picking out a masticating juicer. Masticating juicers should be able to turn just about any fruit or vegetable into a pulp. Some of the best masticating juicers have add-ons that allow you to process citrus, leafy greens and other tough-to-juice items. When you turn more items into juice, you get a healthier drink with better nutrients. Because you want your freshly squeezed juice to taste great, a more versatile masticating juicer means you get a product that’s nutritious and delicious. Juicers may also have attachments that help turn nuts into nut butters as well as a mincing function for herbs and spices. Some juicers can even grind coffee with the right attachment. Look for a masticating juicer that touts the ability to turn anything it touches into a liquid or very fine particles. Then it needs the quality to back up that statement. Masticating juicers use teeth to grind juice out of fruits and vegetables. These teeth can be hard to clean, but they are a vital mechanism that make this entire type of juicing worth it. Look for a masticating juicer that is easy to clean. Some masticating juicers use a self-cleaning function that cleans the apparatus before you send fruits and vegetables through the mechanism. After you’re done juicing, you clean the main part of the juicer in the sink with hot, soapy water. The juice reservoirs might be dishwasher safe, but the bulk of your masticating juicer needs regular hand washing to maintain its efficiency. Juicers might have wide ranges in capacity. If you’re going to spend upwards of $250 on even the least expensive masticating juicer available, you may as well buy one that produces a lot of juice at once. Fresh juice from fruits and vegetables extracts tons of beneficial vitamins and minerals from these foods. When you drink more juice, you get more nutrients out of your foods. You may as well get a high-capacity juicer so you get higher amounts of nutrients in one sitting. An extra half cup or a cup of juice can add even more power-packed items to your daily diet. Although centrifugal juicers are faster, masticating juicers can still produce juice in a very short amount of time. Find the best masticating juicer that makes a lot of juice in a short amount of time for you. The best masticating juicer has variable speed selections for when it shreds soft fruits and vegetables versus hard ones. It takes lot less power to juice a tomato or strawberry versus celery or cantaloupe. Pulp: Masticating juicers may come with different pulp screens that filter out the pulp from the juice. Finer screens leave behind more pulp, while screens with larger holes put more pulp in the juice. Quiet: If you have other people asleep in the house, a quiet masticating juicer is the way to go. Price: Masticating juicers are more expensive than centrifugal juicers. Expect to pay $250 on the low end versus more than $500 for a high-end masticating juicer, although the popularity of these juicers may drive prices down. That being said, it’s time to examine 10 of the best masticating juicers you can buy today. Can easily process even baby food. SKG’s premium 2-in-1 anCti-oxidation slow masticating juicer touts the fact that the high-quality construction prevents nutrient loss on several levels. The 150-watt motor juices at 65 RPMs to prevent heating the food.A sealed valve quickly separates the juice from the straining mechanism. A sealed valve also keeps the juice in the reservoir until you’re ready to pour it out. Juice can be kept in the refrigerator for up to three days after juicing. Pulp goes out the back side of the juicer into a separate container for easier clean-up. Just dump the pulp into your compost pile and you’re ready to go for the next batch. 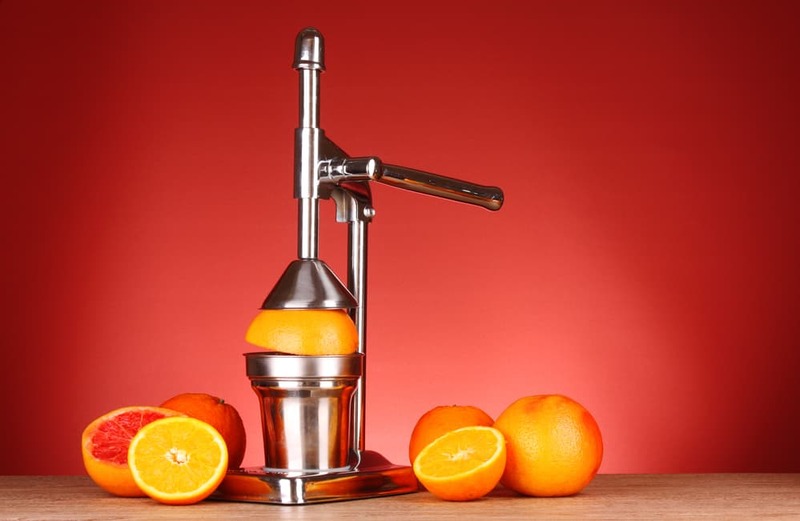 The manufacturer claims this juicer can extract 85 to 90 percent of the juice from an orange, 65 to 75 percent of juice from an apple and 42 to 47 percent of juice from a carrot. You may have to go through several carrots to get the full nutrition of these vegetables, but the juicing is well worth it considering it saves time over chewing and eating these foods as a whole. This versatile machine also acts as a food processor that comes with a slicing and shredded blade. Slice potatoes carrots and cucumbers, or shred lettuce, cabbage and cheese. This masticating juicer comes with an adjustable food pusher. Gourmia’s GSJ-300 masticating juicer claims it can juice whole fruits and vegetables without precutting them thanks to the wide-mouth feed tube and food pusher. A low-RPM motor keeps the juice from oxidizing quickly, while all of the plastic parts of the juicer are BPA-free and dishwasher safe. This masticating juicer comes with two 33.8-ounce jugs, both of which have easy-to-grasp handles. One is to catch the juice, and the other serves as a pulp tank. At more than 32 ounces, you can make up to four one-cup servings of juice at a time. You can drink some fresh and save the rest, or have a veritable smorgasboard of 32-ounce goodness all at once. Each jug has a spout for easy pouring. One filter removes the foam before the juice exits the device, while another filter reduces pulp as much as possible. A valve keeps the juice from pouring out until the container is full. This keeps the juice from oxidizing faster. Color-coded parts help you visualize what’s happening inside the juicer. White filters strain fine particles, while the distribution valve is yellow. Clear plastic on the outside lets you see what’s going on everywhere else. The plastic parts disassemble easily for cleaning. You can even clean the spiral teeth that extract the juice. Valve keeps juice inside until filled. Omega’s J8006 Nutrition Center is a beauty to behold. Unlike other masticating juicers, this one is more horizontal than vertical. Out of nearly 2,900 reviews on Amazon, this is the highest-rated and bestselling masticating juicer sold by the e-commerce giant. This model comes in eight colors, but the awesome features are what make this masticating juicer a top buy. The handle makes it easy to transport, and you’ll need that because this heavy-duty juicer weighs 18 pounds. The plastic parts of the juicer assemble easily on the end of the motor. The auger turns at 80 RPMs rather than 60 to 65 RPMs in slower models. Compared to more than 1,500 RPMs on centrifugal juicers, this model still keeps your juice in good enough shape to store for 72 hours afterwards. The versatility of this masticating juicer is why so many people love it. You get fantastic juice from kale, celery, cucumbers and even wheatgrass. However, with the included attachments you can make so much more. Grind coffee for a fresh cup of joe every morning. One extruder lets you make fresh pasta noodles. The food processor attachment is perfect for making salsa and chopped salad. A homogenizer attachment allows you to make fresh baby food, nut butters and fresh, frozen desserts. Omega touts a GE auger that is eight times stronger than comparable augers in other models. The auger is the spinning device in the juicer that masticates the fruits and vegetables. If the auger isn’t strong enough, it jams and it won’t turn. A strong auger with low RPMs is what you need for perfect juice. The price is in the middle range, but that’s a good thing. That means the company put some thought into the construction without using the cheapest parts available just to get a juicer on the market. Omega really thought this one through, and it shows. Omega warranties the motor for 15 years. Is this the best masticating juicer for you? Hurom manufactures a great vertical juicer that uses the same powerful auger as the Omega J8006 model. Hurom uses its slow-squeeze technology to produce high-quality juices without losing vitamins and enzymes present in the fruits and vegetables. This easy-to-use vertical juicer has a pulp level lever that lets you control how much fiber you get you in your juices and smoothies. If you want less pulp, put in the fine strainer.If you want more pulp, the coarse strainer is the way to go. This versatile juicer creates baby food, smoothies and nut milks as well as nutritious juices from leafy vegetables, apples, kale and wheatgrass. The pulp comes out nearly dry, so you get a lot of juice squeezed out of every fruit and vegetable.This juicer weighs nearly 20 pounds, so it’s heavier than the Omega model. The manufacturer warranties parts for two years and the motor for 10 years. You even get a recipe book as an added bonus. Omega’s J8004 is the smaller cousin to the J8006, yet it is just as powerful. At 80 RPMs, it squeeze every bit of juice out of fruits and vegetables, and it does so quicker than comparable masticating juicers. The combined auger, torque and motor create the equivalent of a two-horsepower motor. Omega touts a two-stage juicing system that extracts as much juice as possible. First, it crushes and fruits and vegetables. Then the pulp is squeezed in the second stage to extract even more juice. The juice comes out of the bottom spout, while the pulp goes out of the extruder end. Much like the other Omega juicers in this review, the extruder creates pasta, nut butters, salsa, baby foods and smoothies with ease as a versatile food processor. Four tiny plastic feet keep this juicer above the countertop. Consider the Omega J8003 the younger sibling of the J8006 and J8004. It costs less, has a smaller motor and the extruder is smaller. Yet, it has all of the same features as the J8006 and J8004 with 80 RPMs, a dual-stage juicing system, and a versatile extruder that makes pasta, ground herbs, baby food, nut butters and smoothies. It cannot make nut milks unlike the other Omega juicers in this review. Stainless steel mesh filters the pulp from the juice, and a stainless steel sieve completes the job by removing the foam from the juice. Both functions create a nearly dry pulp a lots of juice. The major difference between this masticating juicer and the other two from Omega involves the size and power of the motor. This item weighs about one pound less, and that’s because the motor is smaller. You may not get as much power out of the motor, but this product works just as well as the others in the Omega line if you want to juice fruits and vegetables. Big Boss seems to be a misnomer for its masticating slow juicer. In reality, this machine is very compact. The juice cup sits underneath the spout while the pulp collects at the end of the contraption. Stainless steel mesh filters the pulp from the juice as the auger spins around. The entire juicing process, from assembly to clean-up, takes about 20 minutes total. A brush cleans pulp out of hard-to-reach places, while the plastic and metal parts of the spout disassemble so you can clean them individually. Unfortunately, some of the flimsy plastic parts tend to break easily. This is true for the juice cup that catches the juice. You might have a hard time getting the cup in and out of its mount, which could lead to even more breaks, cracks or leaks. Although this is a compact juicer, it may not be worth the lower price. SKG comes through again with this beautiful New Generation slow masticating juicer. The juicer comes with a massive 250-watt motor to handle even the toughest of vegetables at 43 RPMs. The chute is 3.15 inches wide, so it can handle larger fruits and vegetables. Much like the other SKG model in this review, a valve keeps the juice inside until you’re done juicing. This reduces oxidation of the juice before it even hits the cup. A stainless steel filter on the inside separates the juice from the pulp. The pulp goes off to one side while the juice comes out the front spout. The foam and pulp are filtered out by a second filters. For Amazon customers free tech support is included. You get a 30 days Amazon backed return policy. After that, the manufacturer has a two-year warranty on parts. If you like a compact juicer that sits upright in your kitchen without taking up a lot of counter space, this is your juicer. VonShef also makes a compact, vertical design similar to the SKG models. The bottom part looks like a blender, with the middle part similar to SKG engineering and a wide-mouth chute on top. Unlike the SKG products in this review, the VonShef has 80 RPMs of power instead of 65. That means it produces juice faster while remaining cool and powerful. You get two jugs with this juicer, one to contain the juice and another to contain the pulp. A bush helps you clean the insides thoroughly, and a pusher keeps the fruits and vegetables moving forward into the juicing chamber. A stainless steel filter helps separate the pulp from the juice. Three buttons control this masticating juicer, and a digital readout above the buttons shows what speed you’re on. One button turns the juicer on and off, another has a slow speed and another activates a faster speed. VonShef has an easy-clean feature simply by running water through the machine. Otherwise, all non-electric parts are dishwasher safe. You can easily disassemble the chamber to clean everything.VonShef has a lighter juicer at just 10 pounds. It might have trouble with thicker fruits and vegetables, so make sure you chop up the tougher ones so the juicer doesn’t struggle. Breville usually makes high-end kitchen appliances and gadgets. Its BJS600XL masticating slow juicer is no different. This high-tech beauty has a 240-watt motor that is ultra-quiet and powerful at the same time. You control the direction on the auger if any tough fruits or vegetables get stuck in the juicer. Wait for the juicer to come to a complete stop, push the reverse button and wait for the pulp to dislodge before continuing. Cut up large pieces, such as very long carrots, into smaller chunks for best results. This has a very compact design at less than nine inches across, so it fits easily into the corner of your kitchen counter. Just move it out, place the juice cup under the spout, place the pulp cup under that spout, and turn on the motor.Breville includes a two-step safety feature before you can even start the motor. All parts must be in place, and the lid must lock before the motor runs. Run water through the juicer to clean it in between batches. The disassembled parts, including the filter cup, clean up easily under warm water thanks to the cleaning brush. For the best masticating juicer in my opinion, splurge and spend money on the Omega J8006 Nutrition Center. That’s because it does so much more than make juice. It makes baby food, smoothies, nut milk, nut butters and salsa. It weighs more, and it takes up more shelf space, but this kitchen gadget is a work of art that acts as a food processor, blender and homogenizer all in one tool. The other Omega masticating juicers tie for second place. Breville is not far behind due to its compact model and heavy-duty motor. If you’re going to spend this much on a masticating juicer, get one that is powerful and lasts longer. A 240-watt motor is the way to go. Which is the best masticating juicer? Decide for yourself from these ten masticating juicer reviews. Healthy juicing for 2019.